*Senior surgeon & HOD, FC Balochistan Quetta Pakistan. Address correspondence and reprints request to: Tahir Iqbal Mirza, Senior surgeon & HOD, FC Balochistan Quetta Pakistan. Mirza TI, Akhtar K, Abbas HB, Sameena M, Tahir F, Khan S, ur Rehman Bhutto A. Deramatofibrosarcoma Protuberans Male Breast: A Case Report. Oman Med J 2011 Sept; 26(5). Mirza TI, Akhtar K, Abbas HB, Sameena M, Tahir F, Khan S, ur Rehman Bhutto A.
Dermatofibrosarcoma Protuberans Male Breast: A Case Report. Dermatofibrosarcoma protuberans is a relatively uncommon soft tissue tumor involving the dermal layer of skin with intermediate-to-low grade malignancy. Although metastasis rarely occurs, Dermatofibrosarcoma protuberans is a locally aggressive tumorwith a high recurrence rate. We treated a 35-year-old male patient with Dermatofibrosarcoma protuberans left breast at Pakistan Air Force hospital Karachi. The reluctance on the patient’s side unnecessarily delayed operative procedure. Allowing wide safety margins during resection, an extended resection was carried out. The patient was later subjected to radiotherapy. Keywords: Dermatofibrosarcoma protuberance; Rare; Male breast. Dermatofibrosarcoma protuberans (DFSP) usually occurs in age groups between 20-50 years. It has rarely been reported in newborns and more elderly individuals. It was Hoffman,1 and colleagues who endorsed the term ‘Dermatofibrosarcoma protuberance’ (DFSP) in medical literature in 1925, after modification of the existing word - dermatofibroma. The tumor appears as a very small nodule on the skin surface, it is composed of firm, irregular nodules varying in color, from flesh to reddish brown. It remains in the same shape for years, but then it undergoes a period of very rapid growth where many small nodules in the dermis form a larger, more noticeable mass. This mass starts bulging towards the epidermis, hence the term "protuberans," it may also present as a morphea-like, atrophic, sclerotic, and violaceous plaque without nodularity that may ulcerate as it slowly increases in size. Due to stretch and strain, it may turn into a weeping ulcer. It can invade fat, muscles and even bones. Distant metastasis is there but rare. DFSP most commonly occurs on the trunk, followed by the proximal extremities. It rarely occurs above the neck. Some cases of female breast involvement have been noticed, but involvement of the male breast is very, very rare. Surgical scars, old burns, contractures and sites of vaccinations have all been reported as DFSP sites.2,3 Platelet-derived Growth factor (PDGF) increase response leads to increased formation of tumor cells by reciprocal translocations of chromosomes 17 and 22,t(17;22), and supernumerary ring chromosomes composed of interspersed sequences from bands 17(17q22) and 22(22q12).4,5 Treatment is primarily surgical, with chemotherapy and radiation therapy sometimes being used. There is clinical evidence that Imatinib,6 which inhibits PDGFB, may be effective for tumors positive for the t(17; 22) translocation. A young male nurse presented with dark colored swelling on the outer upper quadrant of the left breast area. It was about 3.5x 2.5 cm, soft, non-adherent swelling. The regional lymph glands were not accessible. Ultrasound scan demarcated a soft tissue swelling with no cystic component, while FNAC revealed inadequate sampling; an incisional biopsy was advised in May 2008. A specimen measuring approximately 5 × 3-4 cm was sent for histopathology. It read as Dermatofibrosarcoma protuberans and wide local excision (WLE) was suggested but compliance from the patient was poor, despite repeated counseling. When he turned up at the surgical outpatient department after about nine months of follow up visit, he had already developed a huge swelling at a previous scar area, (Fig. 1). At that time, the swelling was firm, measuring about 7.5 × 7 cm, but mobile. The regional glands were still not accessible and chest radiological examination was within normal limits. At this point, the patient consented for surgery. 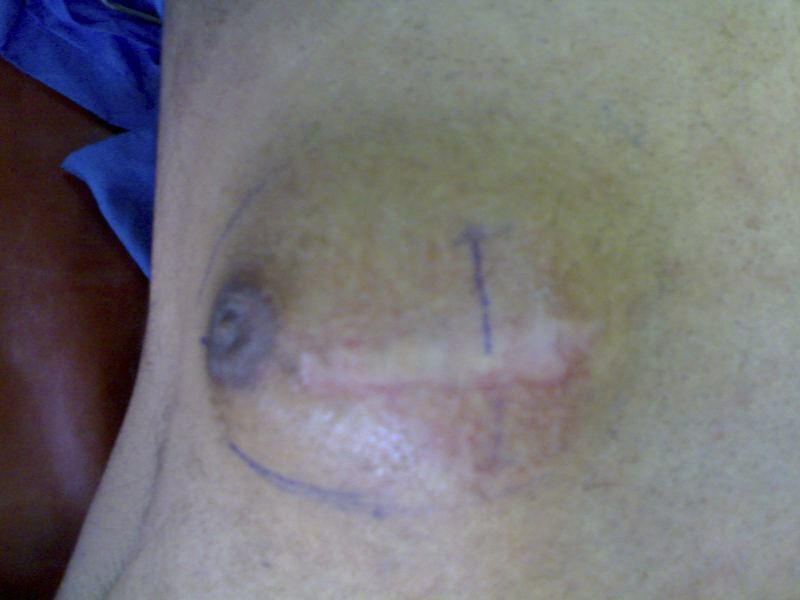 In March 2009, he underwent surgery and wide local excision (WLE), with up down stabbing of the skin to reduce tension while closure was carried out (Fig. 2). Recovery was uneventful. 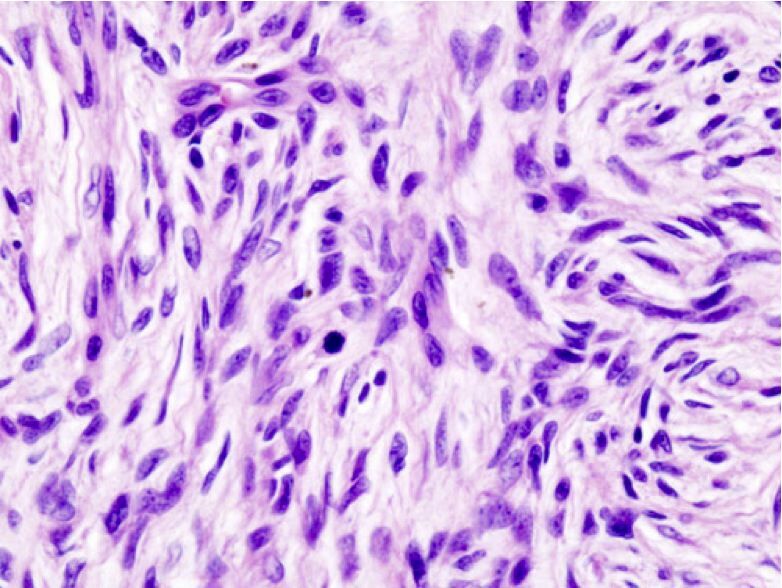 Histopathology revealed monomorphous bland spindle cells arranged in a storiform or "herringbone" pattern. Immunohistochemical analysis showed staining for CD34, suggestive of recurrent DFSP breast left. Radiotherapy after detail discussion with oncologist, radiotherapist and histopathologist was done. The patient is currently engaged in his normal pursuits. Figure 1: Dermatofibrosarcoma Protuberans (recurrence male breast). 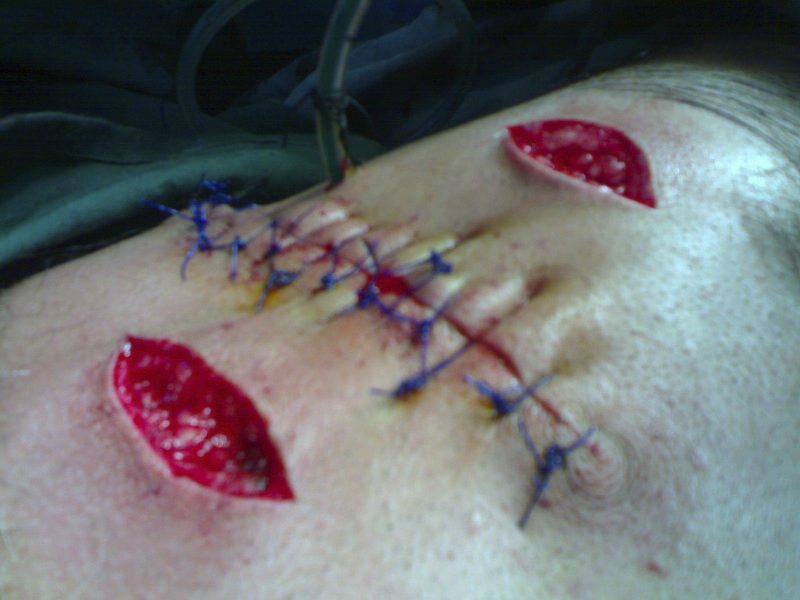 Figure 2: Up and down stab incision to release tension on skin. Figure 3: Recurrent Dermatofibrosarcoma Protuberans (microscopy – what magnification?). It was previously considered that DFSP does not present with any specific community, ethnic or geographical tendencies, but after reviewing the cancer cases from 1973 to 2002 by Criscione and Weinstock,7 it was found that the annual incidence of DFSP in the United States is 4.2 per million cases per year, and was predominant in black males with a DFSP pigmentary variant Bednar tumor (6.5 cases per million), compared to white males (3.9 cases per million).7 In another study by Rutgers et al. of 514 patients, 57% were males.3 DFSP accounts for less than 0.1% of all malignant neoplasms and approximately 1% of all soft tissue sarcomas. In our study, it was noticed that this was the first case for the last five years in this hospital. It is commonly seen on the trunk of the body (chest, abdomen, and back) but can also occur on arms, legs, head, neck, hands, or feet. Few cases of female breast area involvement were reported, but involvement of male breast is less likely supported by medical literature. A recent case report by Cavusoglu and colleagues affirms that breast involvement even in female is a very rare incidence.3 A study by Karcnik et al. similarly advocated very little involvement of the breast.8 DFSP is a very slowly growing tumor. Because of the slow progression, the diagnosis is often delayed, as in our case who reported for the first time after eight years of attaining the swelling. 1. Dr Fasiha Yousaf Mirza. For her contribution in review of literature. 2. Dr. Adnan Ali. For physical and moral support. 3. Aima, Usama and Abdullah Tahir Mirza for computer work. 1. Lemm D, Mügge LO, Mentzel T, Höffken K. Current treatment options in dermatofibrosarcoma protuberans. J Cancer Res Clin Oncol 2009 May;135(5):653-665. 2. Shimizu A, O’Brien KP, Sjöblom T, Pietras K, Buchdunger E, Collins VP, et al. The dermatofibrosarcoma protuberans-associated collagen type Ialpha1/platelet-derived growth factor (PDGF) B-chain fusion gene generates a transforming protein that is processed to functional PDGF-BB. Cancer Res 1999 Aug;59(15):3719-3723. 3. Rutgers EJ, Kroon BB, Albus-Lutter CE, Gortzak E. Dermatofibrosarcoma protuberans: treatment and prognosis. Eur J Surg Oncol 1992 Jun;18(3):241-248. 4. Simon MP, Pedeutour F, Sirvent N, Grosgeorge J, Minoletti F, Coindre JM, et al. Deregulation of the platelet-derived growth factor B-chain gene via fusion with collagen gene COL1A1 in dermatofibrosarcoma protuberans and giant-cell fibroblastoma. Nat Genet 1997 Jan;15(1):95-98. 5. Maki RG, Awan RA, Dixon RH, Jhanwar S, Antonescu CR. Differential sensitivity to imatinib of 2 patients with metastatic sarcoma arising from dermatofibrosarcoma protuberans. Int J Cancer 2002 Aug;100(6):623-626. 6. Criscione VD, Weinstock MA. Descriptive epidemiology of dermatofibrosarcoma protuberans in the United States, 1973 to 2002. J Am Acad Dermatol 2007 Jun;56(6):968-973. 7. Karcnik TJ, Miller JA, Fromowitz F, Abujudeh H, Hertz MB. Dermatofibrosarcoma protuberans of the breast: A rare malignant tumor simulating benign disease. Breast J 1999 Jul;5(4):262-263. 8. Cavuşoğlu T, Yavuzer R, Tuncer S. Dermatofibrosarcoma protuberans of the breast. Aesthetic Plast Surg 2003 Mar-Apr;27(2):104-106. 9. McLelland J, Chu T. Dermatofibrosarcoma protuberans arising in a BCG vaccination scar. Arch Dermatol 1988 Apr;124(4):496-497. 10. Dawes KW, Hanke CW. Dermatofibrosarcoma protuberans treated with Mohs micrographic surgery: cure rates and surgical margins. Dermatol Surg 1996 Jun;22(6):530-534. 11. Brown MD. Recognition and management of unusual cutaneous tumors. Dermatol Clin 2000 Jul;18(3):543-552. 12. Dagan R, Morris CG, Zlotecki RA, Scarborough MT, Mendenhall WM. Radiotherapy in the treatment of dermatofibrosarcoma protuberans. Am J Clin Oncol 2005 Dec;28(6):537-539. 13. Gloster HM Jr, Harris KR, Roenigk RK. A comparison between Mohs micrographic surgery and wide surgical excision for the treatment of dermatofibrosarcoma protuberans. J Am Acad Dermatol 1996 Jul;35(1):82-87. 14. Abbott JJ, Oliveira AM, Nascimento AG. The prognostic significance of fibrosarcomatous transformation in dermatofibrosarcoma protuberans. Am J Surg Pathol 2006 Apr;30(4):436-443.